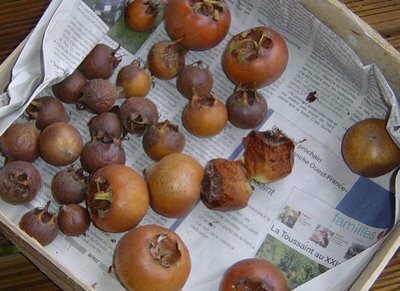 The medlar tree article reminds me of my childhood. At the back of our pub and its large grden was an orchard to which we had open access. Yes you've guessed amongst the pear and apple trees was a medlar tree. I remember it had a rather strange and distinctive taste. Iexpect you wil do something inventive with the fruit? First I've heard of medlars or bletting. Fascinating! I'm visiting from the Festival of the Trees....sounds like you have a lovely place there! I've heard of medlars, but didn't know much more than the name and that the fruit was a bit like apple. Thanks for an informative post about the medlars.